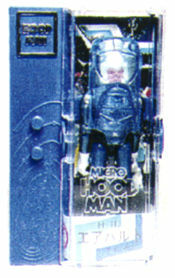 The Hoodman figure is based on a manga character which existed outside the Microman story and was assimilated into it. 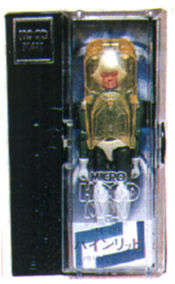 The Hoodman figure is at least a full head shorter than the standard Microman figures. 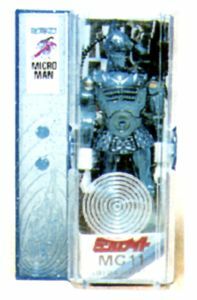 They were less expensive than your average Microman and probably served as inspiration for Galactic Defender, or at least his hood. 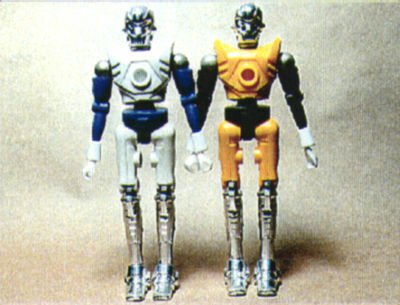 Most notably, H701 through H713 have faces which are painted in fleshtone, rather than chrome. 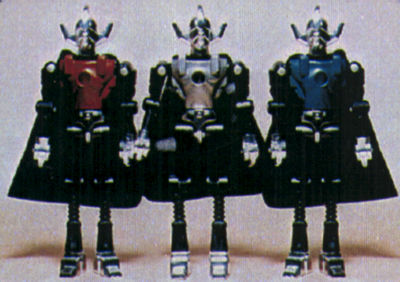 They are the only Microman figures from the original line which have faces painted in this way. 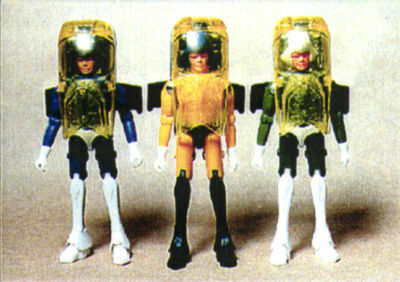 Also released in 1978, these three figures are grouped separately due to the color of the hoods and the capsules. These hoods were transparent blue while those of the other set of three were transparent yellow. 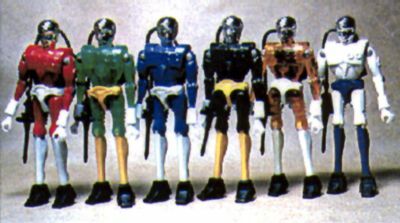 Also note the difference in base color of the capsule - these figures came in medium blue colored capsules, where the figures above (H701-3) came in a capsule which was nearly black. 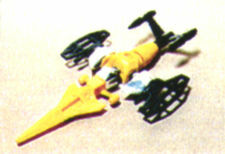 This is the main series from 1978, and it is very basic in its design because, by this point the vehicles and playsets had become Takara's focus. 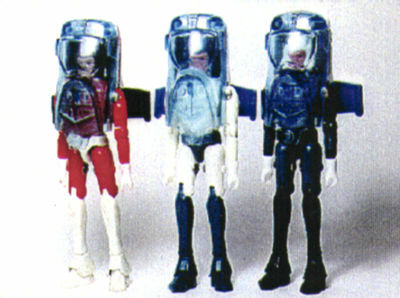 Each figure came with a backpack identical to that of Membros and a gun which attached to that backpack with a hose identical to Membros' hydrapipe. 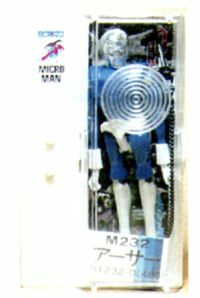 This Microman figure is easier to obtain than most. 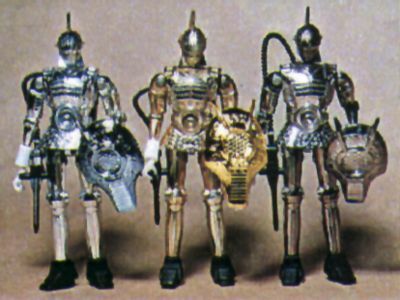 The Microman Knights are almost as highly prized as the Lady Command series. 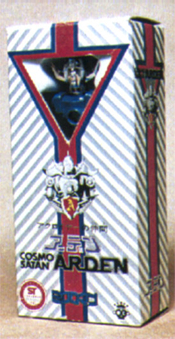 The figures have no names, but they do have the Police Keeper shield and gun. 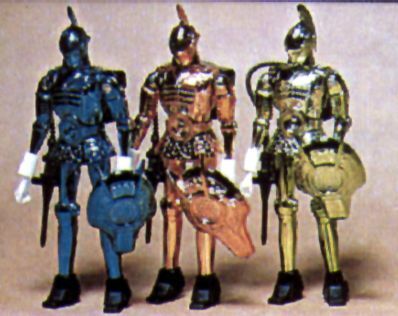 MC 8, 9 and 10 were released first, but MC 11, 12 and 13 (listed below) never showed up in any catalogs and because few people knew to look for them, they are very hard to find today. 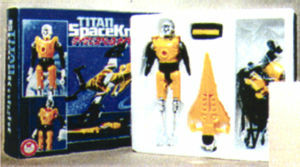 The magno-powered Titan Space Knight. 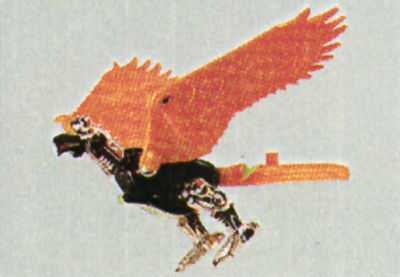 Assembles into a spaceship in much the same way Red Falcon assembles into a bird. 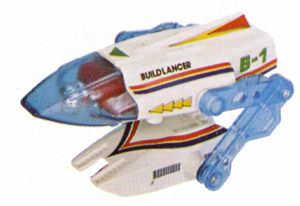 The torso serves as the main body of the ship, and a nosecone, wings and tail attach to it. 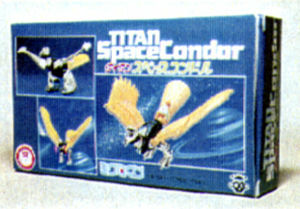 Titan Space Condor. 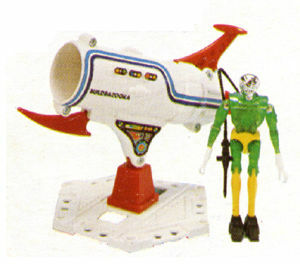 Identical to the regular Condor, except the accessories that convert it to the spaceship are gold. 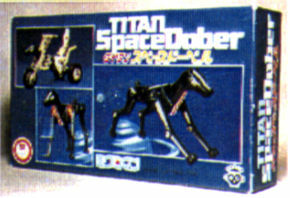 Titan Space Dober. 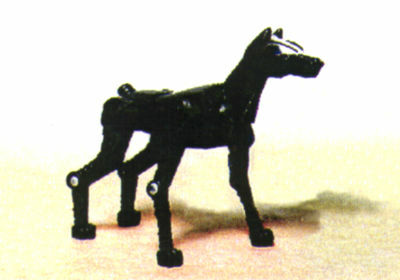 Identical to the regular Dober, except that the attachments which transform it into the motorcycle are gold. Acroyear Arden. A full redesign of the Acroyear II, also meant to depict a different character though. It's features are smoother and there are fewer right angles to it. 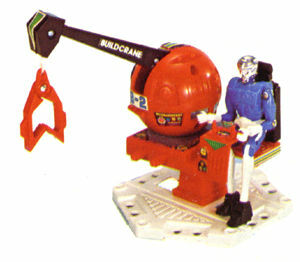 Comes with a flexible cape. The cape is either plastic or cloth.